Design is involved in the initiative by means of participatory practices and the design of furniture in public space. An ´open´ city is hospitable;, diversity and differences are appreciated. Inhabitants negotiate their conflicts. Is Graz an ´open´ city in that sense? Do inhabitants of Graz deal with their conflicts in an open way in public space? To explore that question a unique and clearly visible table sculpture was designed by the Austrian artist Markus Wilfling. 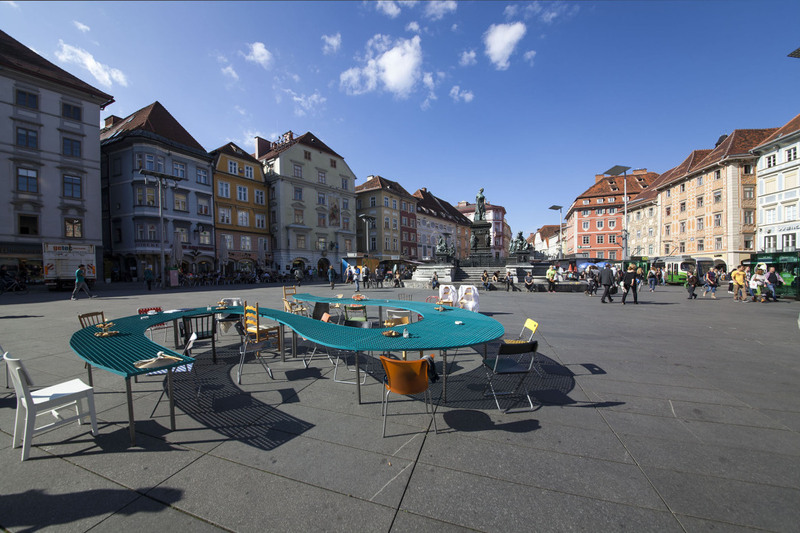 The table was not only a nice piece of art or design, but was designed in a way which enables the participants to talk to each other in a ‘flowing’´ effortless way by changing position and conversational partners by simply turning around. “Formation. Voting included.” defines itself as an example of “New Genre Public Art”. It is not only about political forms of activism but also about concepts and actions that take place on a social level due to the interaction with people of very different social backgrounds.